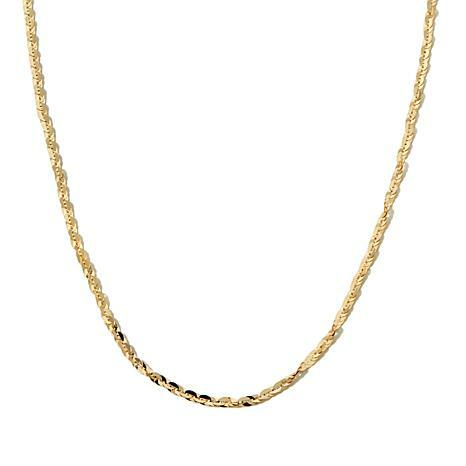 22" 20" 18" 16" 24"
For bold, gold shimmer, you can't beat the look of this fancy-link chain necklace. 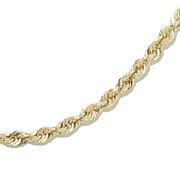 The 3mm chain has flat, oval links in a twisted pattern that reflects the light beautifully. It's great to wear alone but makes an unconventional, beautiful base for favorite pendants too. Very sturdy, high quality, sparkly. I have just received my Micheal Anthony Cleo 20" Link necklace and it is bling fabulous. After given it great consideration I decided to treat myself and I must say that I'm not disappointed. It came very quickly and I love it. I have several pieces from Michael Anthony and I always get alot if compliments whenever I ware 1 of his pieces. I purchased a 24" Cleo link necklace for myself. When it arrived and I saw it in person I paired it with a pendant i had just purchased for my sister. Viola! What a spectacular look. She wore it to a party and it was all the women talked about. I then ordered a 22" Cleo link for myself and just went back and purchase another 20" Cleo link for myself, as I wear (2) special pendants at all times. My neck is bathed in beautiful gold and beautiful sparkled. Thank you Michael Anthony! Beautiful sparkle,and more durable than 14 14kt because I wear it everyday! this is a very pretty and super sparkly chain! Very eye catching! 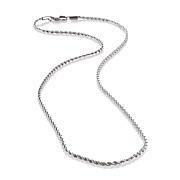 Michael Anthony Jewelry® 10K 2-Tone Dorica Chain - 24"